A part of Missouri Botanical Garden that the public rarely sees is the greenhouse complex, which includes a whole acre under glass! 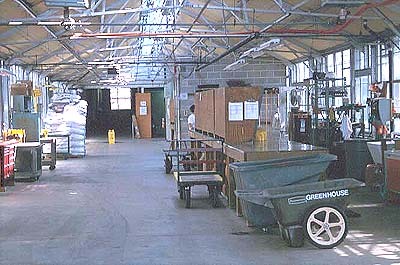 A series of 18 greenhouses are connected to a large central hallway called the Head House. This is where much of the hard work takes place. Staff and volunteers busily propagate new plants from seeds or cuttings, and pot and transplant other plants at workstations designed specifically for these tasks. But the work doesn't end in the Head House. Each greenhouse has routine maintenance tasks, which include watering, fertilizing, pest control, repotting, pruning, and even weeding the gravel floors in some greenhouses. The plants in each greenhouse have different environmental needs. Temperatures, humidity levels, and light levels vary greatly from greenhouse to greenhouse. Even the soil and fertilizer used may be very different. 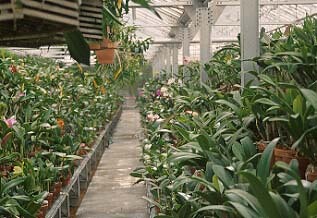 Three of the greenhouses are devoted solely to the Garden's extensive orchid collection. Orchids are divided into a cool house, an intermediate temperature house, and a warm house. The annual Holiday Show and the annual Orchid Show make use of the foliage plants found in three additional greenhouses. The plants range in size from knee high to tree-sized and include tropical foliage, peace lilies, ficus trees, palms, and philodendrons. Former residents of the old Desert House in this area include tree aloe, tree opuntia, bird of paradise, and a giant ponytail palm. 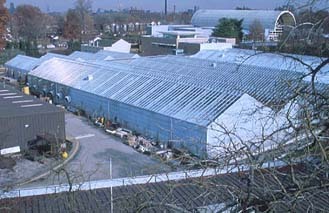 The Horticulture division works closely with the Research division in caring for the plants in three more greenhouses. 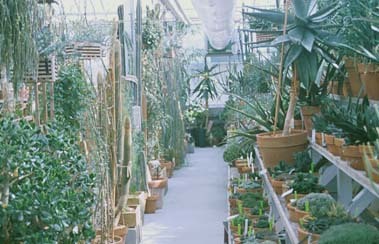 One contains a wide variety of plants collected by researchers. 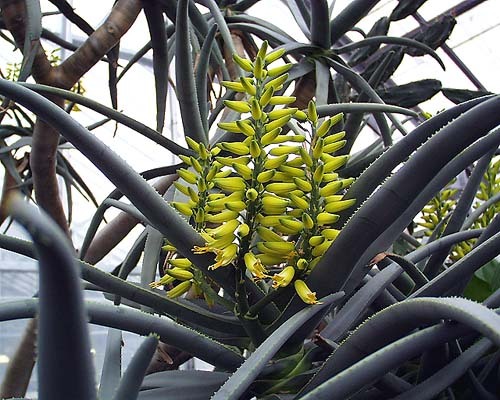 The other two contain all tropical plants, including many aroids. Representing the opposite extreme in humidity, the desert greenhouse is the temporary home of many unusual and rare varieties of cacti and succulents from around the world. The former Desert House, which was located on the south side of the Climatron® , was demolished in 1994. Built in 1913, it was no longer safe for visitors. This wonderful collection of cacti and succulents cannot be on public display until the Garden receives a generous donation to fund the construction of a new Desert House similar to the Temperate House currently on the north side of the Climatron®. In the stock house, cuttings are taken for spring and summer bedding plants used on the grounds. 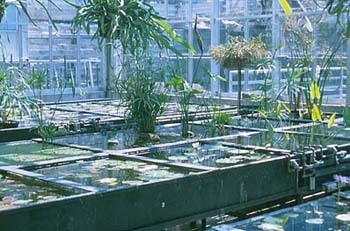 The aquatic nursery occupies half of a greenhouse. Water lilies and other aquatic plants housed here bloom magnificently in summer throughout the Garden's water features. The other half is devoted to newly propagated plants. 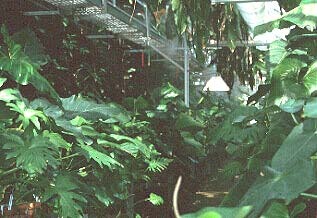 A smaller greenhouse is used as a shade house in the summer. Four production greenhouses are dedicated to spring and summer bedding plants and flowering Holiday Show plants, including more than 2000 poinsettias, the first of which arrives in July as a rooted cutting! 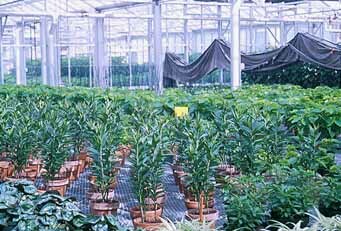 Heated floors are used in two of these greenhouses to encourage root growth in early spring plants, while the foliage above ground is acclimated to temperatures as low as 40 degrees. The public is invited to take a tour of the greenhouses on a specific day in spring, usually on Earth Day. The tour is at a specific time and has limited openings.